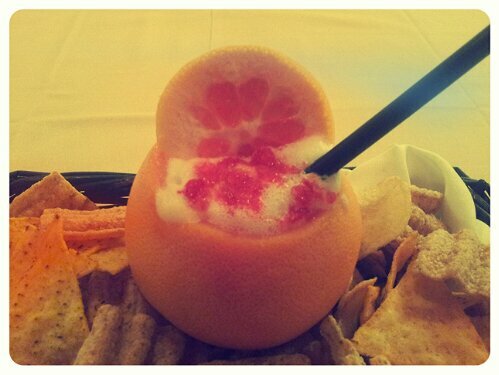 Top wheel of Grapefruit, crystals of Campari and nachos. Combine all the ingredients in a shaker, dry shake, then add ice and shake vigorously for a minute or so, pour in a chilled, emptied ruby grapefruit, and place in a basket with lost of spicy nachos. Tequila and Campari are wonderful together in my opinion, and I always wanted to try a little bit of Campari in a Paloma. This is the result. It’s incredibly fresh and light, velvety, with that hint of herbs and bitterness that only Campari can add. I have been wanting to make dehydrated spirits for quite a while, and I thought this was the perfect time to experiment. To make Campari crystals, just pull out of the oven the crystallized surface of the liquid as soon as it’s hard enough. Heat it up with a flame and then place it in a freezer for a bit. After an hour or so just take it out and turn it into little pieces. This is a step before dehydration, for which Camper has a great project on his website and so here’s the link . This little hybrid of Paloma was a great hit with my guests and it definitely got me excited when the Campari was ready to be taken out of the oven. a Chartreuse Swizzle or a Penicillin, so if you haven’t started yet, get your reading glasses on, and lose yourself into booze history. Ps. sorry for the pics but for some reasons I couldn’t get a decent one.. I think I better start taking a photography course. Great grapefruit glass! Cheers! The round up post is in the works and should be out once all the cats have been herded. Thanx Fred, awesome round up! !